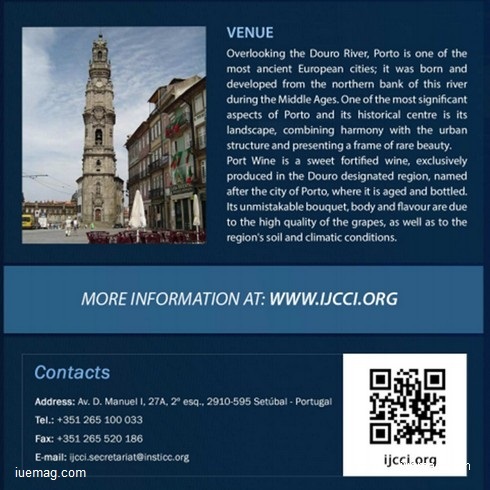 The eight edition of the IJCCI Conference (International Joint Conference onComputational Intelligence) organized by INSTICC (Institute for Systems and Technologies of Information, Control and Communication) will take place from 9 to 11 of July 2016 in Porto, Portugal. One of the most important contributions that IJCCI brings about is the creation of a high-level forum in collaboration with the most prestigious internationally recognized experts who are internationally recognized experts in Computational Intelligence areas, including names such as Joaquim Filipe (Polytechnic Institute of Setúbal / INSTICC, Portugal) as Conference Chair; Juan Julian Merelo (University of Granada, Spain), Fernando Melício (Instituto Superior de Engenharia de Lisboa, Portugal), José M. Cadenas (University of Murcia, Spain ), António Dourado (University of Coimbra, Portugal), Kurosh Madani (University of Paris-EST Créteil (UPEC), France) and António Ruano (University of Algarve, Portugal) as Program Co-Chairs. IJCCI 2016 will be held in conjunction with IC3K 2016. Registration to IJCCI allows free access to the IC3K conference (as a non-speaker). Further information about IJCCI 2016 can be found at the conferences websites: vhttp://www.ecta.ijcci.org/; http://www.fcta.ijcci.org/ and http://www.ncta.ijcci.org/ . Any facts, figures or references stated here are made by the author & don't reflect the endorsement of iU at all times unless otherwise drafted by official staff at iU. This article was first published here on 7th February 2016.